Dear Friends, As some of you may know, I am an employee of Shell in the Philippines. I would like to invite you to read through the article below about the position of Shell on the alleged non-payment of excise taxes worth $7.3 billion to the Bureau of Customs (BoC). This issue obviously affects me personally (I am at risk of losing my job if the refinery closes down) but it also affects all of you. Fuel shortage will bring fuel prices up which will eventually cause other commodities to increase prices too. Double taxation favors importers over manufacturers - if there are less factories, that means lesser job opportunities especially for new graduates. 1. "Other Petroleum Firms are paying their excise tax, but not Shell" - This is not true. Shell, like all other petroleum firms, pays excise taxes on all its finished products to the government. From 2004-2009, Shell has paid over P37 billion in excise taxes for its finished products. 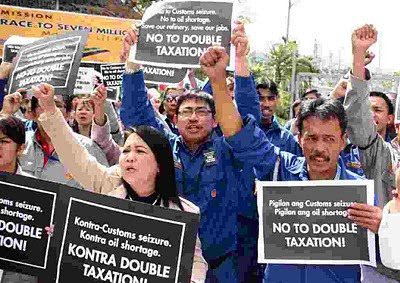 On the other hand, finished product importers like Chevron, Total, and other independent players pay excise taxes to the Bureau of Customs (BOC) upon importation, but do not pay Bureau of Internal Revenue (BIR) excise tax on the same finished products before they are sold to the public. The difference then is when and to whom the tax payment is made to, and not the amount. Shell does not pay excise tax to the BOC on CCG/LCCG because like crude oil, these are intermediate or raw materials. However, Shell pays to the BIR excise taxes on all finished products that are produced from the raw materials, before the finished products are sold. There is, therefore no revenue losses to the government. Finished product importers pay excise tax to BOC, while refiners pay excise tax to BIR. 2. "The position of BOC is that LCCG and CCG is a finished product and that's why (Shell) should resolve and not muddle the issue" - As tested and certified by the Department of Energy (DOE), the agency with the technical expertise to determine whether a product is a raw material or a finished product, as early as 2003, LCCG/CCG is an intermediate or raw gasoline component that is blended to produce PSPC's gasolines to comply with the Clean Air Act (CAA). The Product National Standards (PNS) specifications will also show that LCCG/CCG do not meet the product specifications requirements, and therefore, cannot be sold as finished products. Even the BOC's Verification Committee admitted that Shell has not sold LCCG/CCG to the public but instead uses it as blending component. 3. "There is fraud on the part of Shell since when they imported the product, they listed them at BOC as gasoline, but when Shell goes to BIR it is declaring the imports as raw material" - This is not true. There is no fraud as we have always stated that CCG/LCCG is a kind of gasoline, but which cannot be used in its current specification and has to be blended with other components to meet the Clean Air Act and PNS standards for gasoline. It is therefore an intermediate or raw material. 4. "Shell is blackmailing the government by threatening to stop importing, shut down their refinery and claiming there will be shortages if BOC seize their importations" - Shell is not blackmailing the government. We are simply stating the fact that if BOC seizes our importations, we will have no raw materials to run the refinery and no products to sell. As Shell supplies 30% of the market, it will not be easy for the other oil companies to step into the void. We do not want this to happen but for purposes of transparency, we have to let the public and government know the consequences of the BOC's arbitrary action. In fact, even before the 60-day TRO issued by the CTA expired, Batangas Customs Collector Juan Tan attempted to unlawfully use Section 1508 of the Tariff Code to seize PSPC's goods, despite the fact that the shipments of crude oil, CCG and gas oil were already in the possession of PSPC and all taxes have been paid to Customs. Section 1508 does not authorize Customs to seize property or assets of PSPC, but only incoming importations, yet BOC Collector Tan attempted to unlawfully confiscate PSPC's property forcing PSPC to obtain judicial relief from the Regional Trial Court of Batangas. 5. "Shell is getting special treatment by getting tax exemption as a result of the BIR ruling in 2003" - This is not true. As discussed in item 1 above, Shell has been paying all the excise taxes on its finished products. In fact, as a result of BIR Commissioner Joel Tan-Torres' reversal, Shell is now the only oil company paying excise taxes twice starting January 2010! The House of Representatives Committee on Ways and Means, the lead congressional committee for tax legislation, has issued an official report last January 27, 2010, that found that the Tan-Torres reversal is an imposition of an impermissible act of double taxation on Shell's imports of Catalytic Cracked Gasoline (CCG) and Light Catalytic Cracked Gasoline (LCCG) since it "in effect levies an excise tax twice on CCG and LCCG, first as raw materials upon withdrawal from the port of entry and second as components of a finished product upon withdrawal from PSPC's refinery." The Committee held that the imposition of the said double taxation is "a naked, arbitrary, and whimsical abuse of administrative power by the Commissioner of Internal Revenue and a usurpation of the power to tax solely vested in Congress by the Constitution." results in a policy implication of discouraging manufacturing investments in the country, destroying the higher value added that the industry contributes. The issue similarly reflects abuse of seizure power against importers on contested tax assessments. Furthermore, BOC insists that even if the case is still being heard in court, that Shell provides CASH payment in protest and does not want to accept bonds as security! Shell's Business Principles have for many years been fundamental to how we conduct our business and we have always believed that living by them is crucial to our continued success. We believe that our reputation, which we have built and protected for so many decades, will be upheld if we act in accordance with the law and these business principles. As above, Pilipinas Shell Petroleum Corporation maintains that we have paid all taxes on CCG, and that there are no factual and legal bases for saying otherwise. Shell has consistently been in the Top 10 Taxpayers list of the government and over the last 5 years, our annual tax payments has averaged about P 26 billion per year. Shell will continue to exhaust all available legal remedies for the immediate resolution of this important issue. This issue is important for us, and as part of our business principles, it is also our duty to provide the public with accurate and truthful information, in the spirit of fairness and transparency. Read this article in Filipino: "PARA SA INYONG KAALAMAN - Ang katotohanan tungkol sa Shell tax issue"
I'm still looking for blogs that condemn PSPC. But seeing the replies here makes me happy that the public does understand where the corporate citizen Shell is coming from. Hi Rey - looks like we have a lot in common. HS, Uni, college and work. If they insist on calling finished products yang mga raw materials na yan e di load mo sa gas tanks ng mga cars ng taga BOC as a precondition before Shell pays excise taxes on them. LOL. They seem very sure what they're talking about eh. Kulit ha. the coming election. Ang dami pang sinasabi. Thanks for the clarification Rey. I appreciate how the letter (and your intro) simply state facts without resorting to personal attacks. Truth and justice will prevail. God bless!